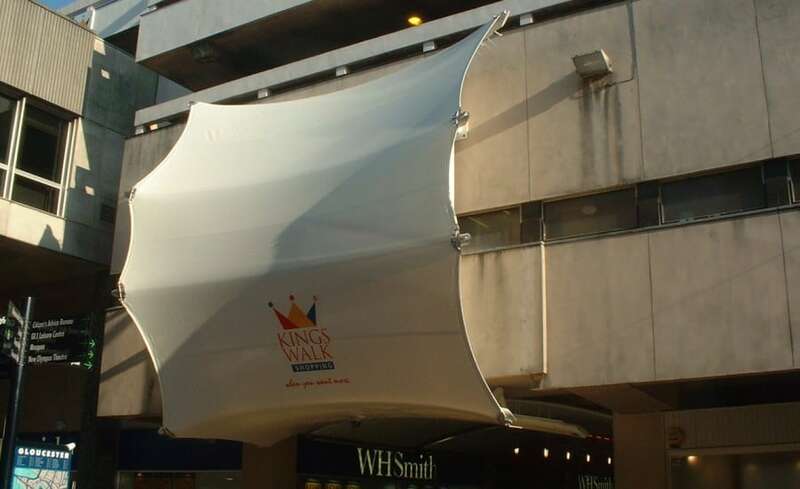 The introduction of Architen Landrell fabric sails within public entrances and concourses provided a cost-effective means of enhancing the retail environment. Computer-controlled lighting of each fabric sail creates a theatrical effect that acts as a device to emphasise evening shopping. 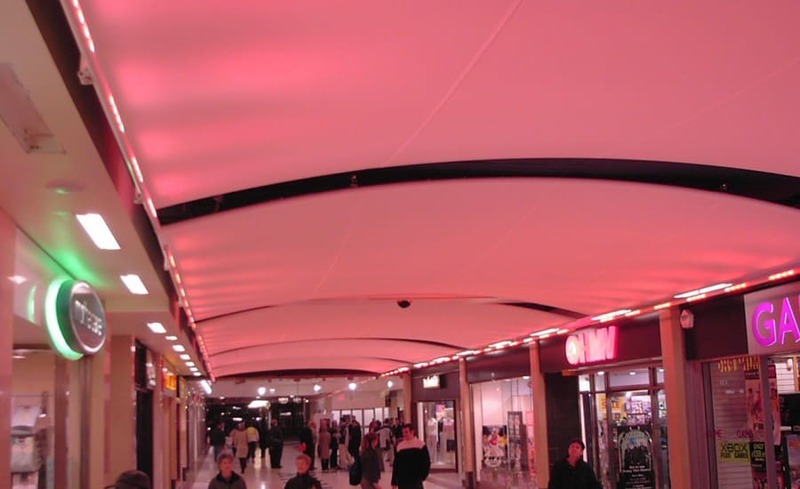 Illuminated by LED lighting, a series of architectural fabric sculptures helped transform Kings Walk Shopping Centre in Gloucester from a dull seventies arcade into a vibrant and colourful shopping experience. 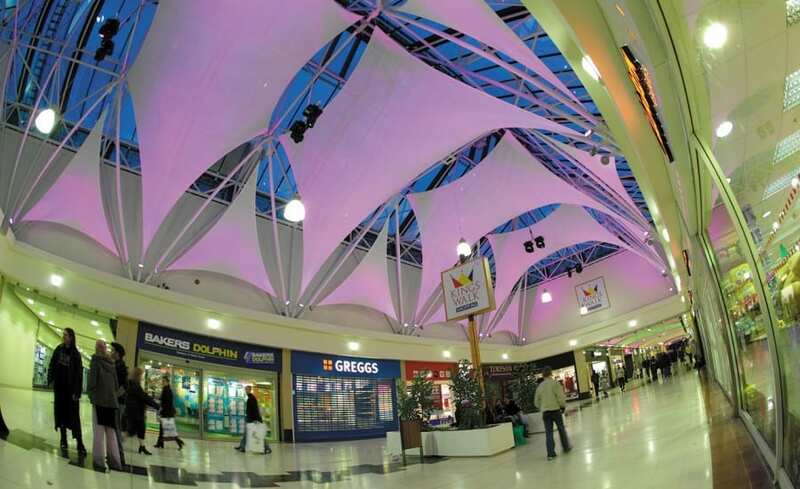 The tailor made fabric sculptures, suspended in three separate areas of the shopping centre, were considered particularly practical due to their size, energy efficiency and ease of care. 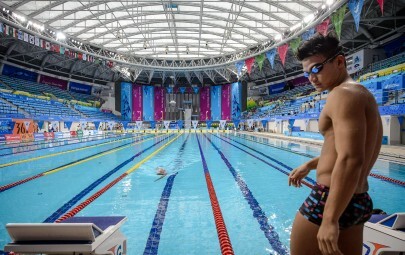 Created out of PVC coated glass mesh, the sail structures allow both natural and artificial light to permeate through the membranes to create a light and airy feel. 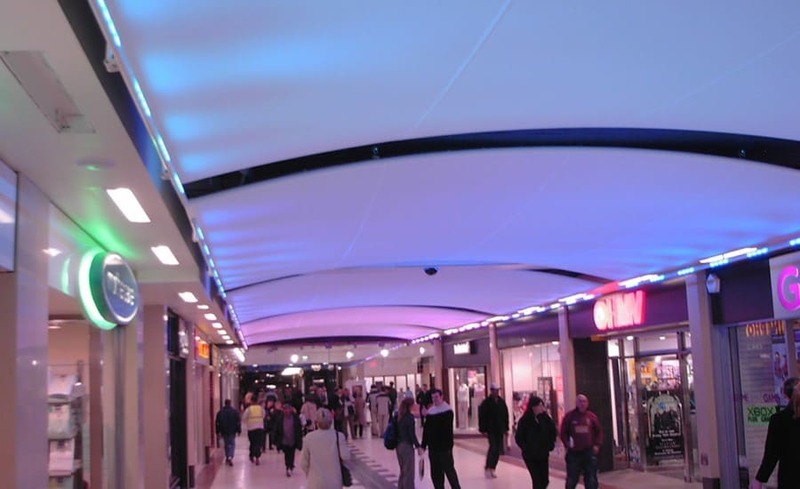 In the entrance concourse, Architen Landrell created a single PVC coated polyester entrance canopy, branded with the shopping centre name and logo, and installed a series of barrel vaults to hide the bare ceiling and services behind. By acting as a fabric screen, it covers up unsightly views and provides an expensive and stylish looking finish. In the larger atrium space the higher ceilings meant that a more artistic solution could be adopted to cover up the metal ceilings. Architen Landrell designed, manufactured and installed a series of hypars which fixed to the steelwork behind, giving the image of kites soaring through the sky. The stunning tensile sails combined with state of the art lighting effects show that a little imagination can help transform a drab space into a unique architectural display.